Who else loves to surround themselves with spring colors this time of the year? I sure do. And that's why I treated myself to the China Glaze spring collection called The Arrangement. This post seems like it did forever to create with the photos and all, but I think now I have a very well-rounded post ready for you. So, without further ado, let's get into the collection! Above, you can see all the shades in the collection. 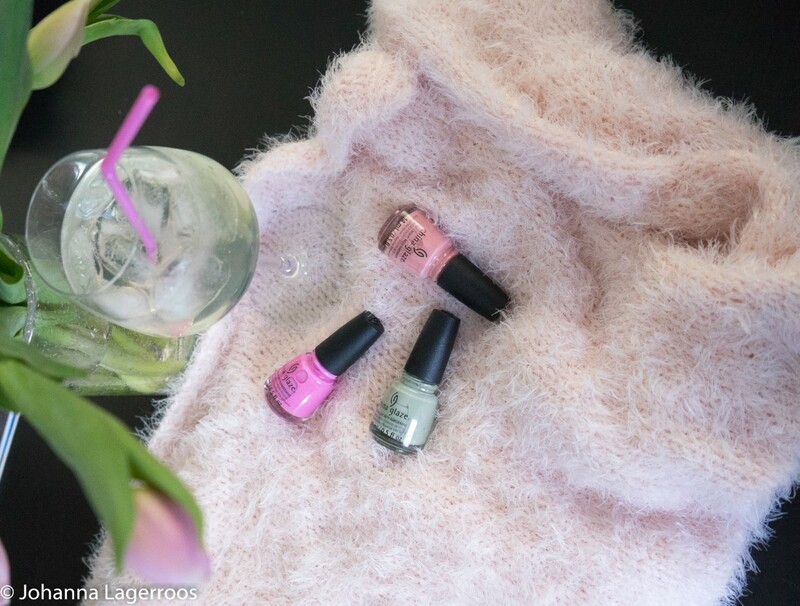 This collection seems to be inspired by spring flowers and the arrangements one can create with flowers - much like you can mix and match these shades to create awesome nail art. I'm not the one to buy whole collections that often, but this one really caught my eye and I had to have every shade. And I'm not regretting that decision for a second. Here you can see every shade swatched on a wheel, but admittedly the glitters/toppers don't really show too well here. I tried to make them pop more in the manicures you'll see a little later. The shades are called (from left to right in the pic): What's Up, Bittercup?, I Still Beleaf, Show 'Em Who's Blossom, This Is Ranunculus, Hydrangea Dangea, Saved By The Bluebell, Wildflower Hour, Lavenduh!, There She Rose Again, Señora Flora, Good As Marigold and Better Than Nectar. There are quite different finishes in the collection which I like a lot, although I usually hit the top coat on every mani anyway to make them last longer. I had to start trying these out the very same day I got the collection. I was torn between these three colors, but decided to go for the green first. My first nails using this collection were these green ones using Show 'Em Whose Blossom for most nails and I Still Beleaf for the accent nails. I loved the simple look of this and the colors are so very pretty. I like that the green cream polish is somewhere between khaki green and mint green in shade, and that is what makes it unique to me. For the next mani, I used Saved By The Bluebell and What's Up, Bittercup? The idea here was to do relatively minimalistic mani and I was itching to do a negative space mani, so this was what I came up with. 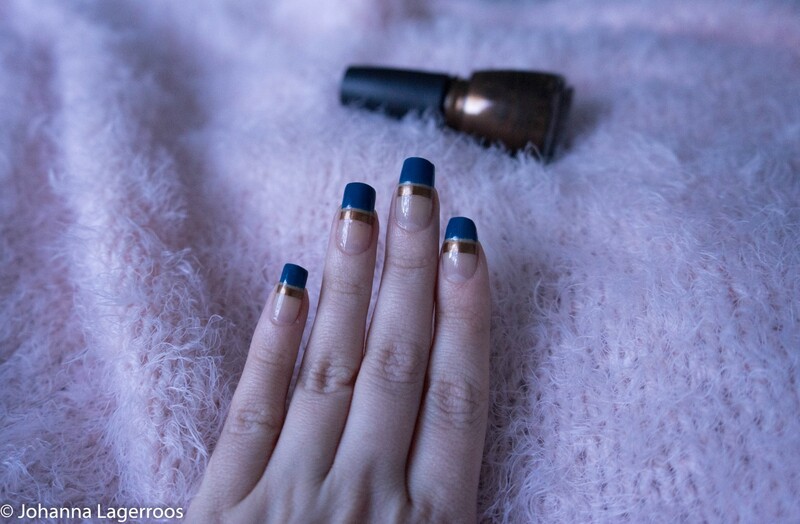 I feel like the dark blue and bronzey metal look so cool together! Next mani was a very lilac one with Hydrangea Dangea, Lavenduh! and Wildflower Hour. I love these shades so, so much, and I think they look great together as well. Light blues and lilacs are probably my favorite shades when it comes to nails and I enjoy coming back to them basically more than anything. Hydrangea Dangea may just be my favorite shade on the whole collection. Then I did a more summer vibed mani. This kind of reminded me of summer festivals, and especially with more bling these would absolutely work as a festival look. I used the shades Señora Flora, Good As Marigold and What's Up, Bittercup? for these. I thought the bronze would bring the mani more together and that's why I added it in. Last but not least, the mani I currently have on, including the shades This Is Ranunculus, There She Rose Again and Better Than Nectar. I'm considering making these into something more decorated tomorrow but we'll see if I end up adding to these or completely doing a new one. I do enjoy the pink and blue combo and with the help of the shimmer topper the pink looks the same finish as the blue. 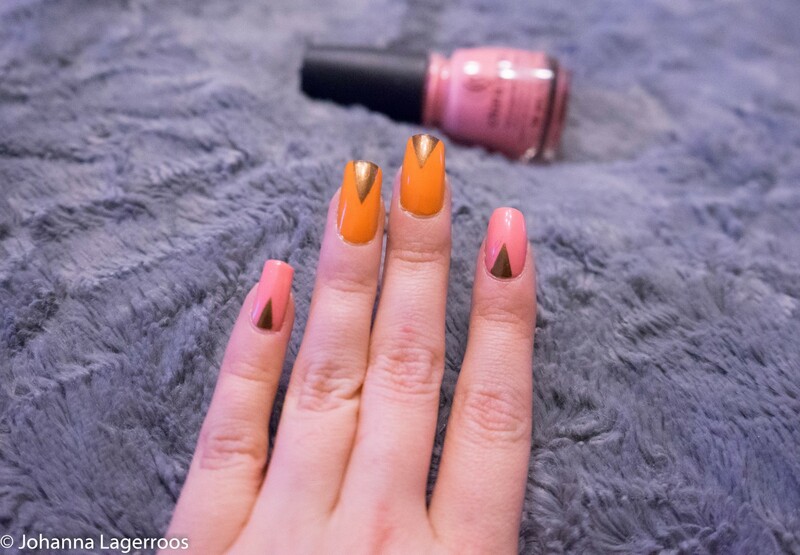 Which shows why you want to have at least one or two toppers to create variety in your manis. If you're into that, of course. I know some people have their signature nail color that never switches and that's just as cool. What do you think about the collection? And, what is your favorite shade? Let me know in the comments! That's it for today's post, I hope you had fun reading this because I sure had fun creating it. If you want to see more manis with these polishes, let me know and I can make that happen - and then I will also make sure they're all taken in the same lighting because apparently I didn't manage to get that right here. Oops. Currently I'm trying to work on few outfit posts, which will get exponentially easier next week when the weather gets warmer and I can actually dress cuter than in this snow weather. Because yes, it snowed yesterday (and somewhere even today) in Finland. Yes, in April. I don't approve. At all. Anyway, for more content you can follow me on Instagram (I'm @silvertigo), where I post my daily outfits and more. I'll see you all in my next post!